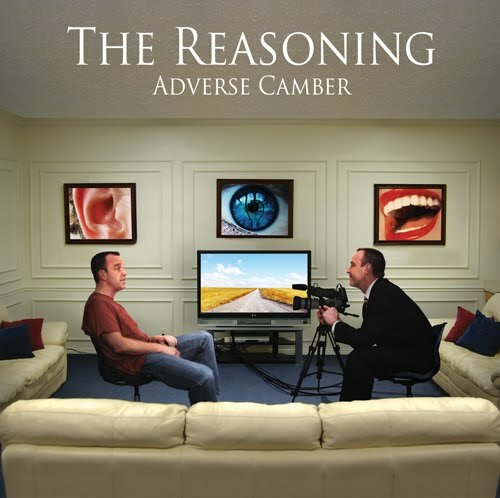 Tuesday 4th May: By now a lot of fans of The Reasoning will have already picked up their copy of the band’s third album, Adverse Camber, which was available to buy on the tour before the general release date of yesterday. In fact, the original pressing of 3,000 has already sold out (but worry not, more are on their way.) I picked mine up at the York gig and it’s been in and out of various CD players since. First, a word about the cover, which is a radical departure from the artwork covers of the first two albums. While it doesn’t scream “prog!” at you, something about it does remind me of Storm Thorgerson‘s work for Pink Floyd. I’m not sure what it is about it as, being honest, it looks nothing like any particular Floyd cover – maybe it’s the slight surrealism in the background pictures – but from the first time I saw it, that was the thought that has popped into my head. Musically, a lot of the album seems not to be made up of full tunes, but snatches of music which ebb and flow around the vocals, never allowing the listener to get bored or to guess what form the songs are going to take. The music on the album varies between the neo-classical, with the piano opening to Script Switch Trigger, and some very heavy metal-like guitar solos. The overall effect, when mixing the vocals and the music is something that hovers just to the light side of the mid point between traditional prog rock and the likes of Evanescence. Highlights for me are the Eastern influenced keyboards and choppy guitars of The Thirteenth Floor and the aforementioned, ballad-like, Script Switch Trigger, my favourite song on the album, which showcases Rachel’s crystal clear enunciation. (Apparently the title comes from a theory of humour but I didn’t follow Rachel’s explanation from the stage and have just been more confused by internet searches…) The Nobody Effect, contains the album’s heaviest guitar work overlaid with some subtle keyboards but I’m afraid I am unable to listen to the chorus without being reminded of Genesis’ Driving The Last Spike. Adverse Camber is a well-above average album and, like its cover, is definitely a bit of a departure from the band’s previous output. However, while there’s nothing actually wrong with the album, I still find myself preferring Awakening. This entry was posted in CD Review and tagged The Reasoning. Bookmark the permalink.